For a list, see List of Governors of Iowa. The Governor of Iowa is the chief executive of the U.S. state of Iowa. The governor is the head of the executive branch of the state government and is charged with enforcing state laws. The officeholder has the power to either approve or veto bills passed by the Iowa General Assembly, to convene the legislature, as well as to grant pardons, except in cases of treason and impeachment. The Governor of Iowa is also the commander-in-chief of the state's military forces. 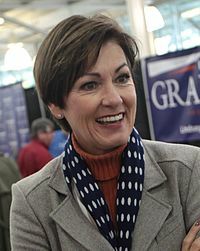 There have been 41 individuals who held the position of Iowa Governor, including the current person and first woman to hold the position, Kim Reynolds, who was sworn in on May 24, 2017. The longest-serving is Terry Branstad, who served from 1983 to 1999 and then again from 2011 to 2017. He is the longest-serving governor in U.S. history, surpassing the previous record of 21 years set by George Clinton of New York. The shortest-serving was Robert D. Fulton, who served 16 days. There are four living former Governors of Iowa, the oldest being Robert D. Fulton (1969, born 1929). The most recent officeholder to die was Robert D. Ray (1969–1983, born 1928), on July 8, 2018. "Governors of Iowa". National Governors Association. Retrieved November 8, 2014. "Constitution of the State of Iowa". Iowa General Assembly. 1857. Archived from the original on July 3, 2011. Retrieved November 8, 2014. "Amendments to the Constitution of Iowa". Iowa General Assembly. 1998. Retrieved November 8, 2014. "Constitution of the State of Iowa". Iowa General Assembly. 1846. Retrieved November 8, 2014. ^ IA Const. art. IV, § 1. ^ IA Const. art. IV, § 9. ^ IA Const. art. IV, § 11. ^ IA Const., art. IV, § 16. ^ IA Const. art. IV, § 7.